The fossil record holds a lot of evolutionary information that can’t be seen on shorter time scales, although the more recent fossil record is more complete. Among other things, the fossil record demonstrates that extinctions can open up ecological space for new speciation and radiation, and that life forms tend to begin small and evolve to be bigger over time. 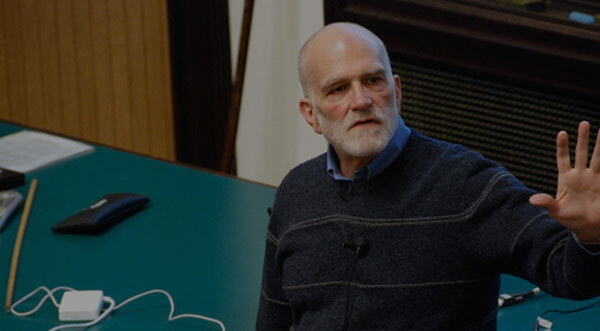 Professor Stephen Stearns: Then today we’re going to take our third look at the history of life on this planet, and it’s going to be about the fossil record and the major groups of life. You remember, the first look was major transitions, and the issues involved in them. The second look was how life shaped the planet and how the planet shaped life; so it was a description of the geological theater in which evolution has occurred. And today we’ll actually look at the fossil record, which has its own unique and important messages. So I’m going to again give you another view of geological time. This is something that’s important to build up in your head. It takes awhile. The names are unfamiliar, the depth of time is astonishing. But it’s a very necessary framework for understanding evolution on this planet. We’ll talk about a few big events, the major radiations, the groups that are still expanding, the ones that are vanishing or gone, vanishing communities, extraordinary extinct creatures. Then I’ll mention stasis and I’ll also mention Cope’s law. So here is another way of looking at geological time. Last time I showed you the 24-hour clock. This time I’m showing you a series of blowups, a three-panel blowup. So here is the origin of the planet. Here is today, up here. And the pre-Cambrian is in red. So this is everything before the major animal groups and fossils with hard parts appear. And, as you can see, that’s most of life. Roughly speaking, life begins here, and becomes eukaryotic somewhere around here, and multi-cellular somewhere around here, and we start picking fossils up at the beginning of the Cambrian, in any kind of numbers; there were a few before then. And then if we take everything after the Cambrian–it’s called the Phanerozoic; that’s this column here–and we blow that up, and you can see it falls into the Paleozoic, the Mesozoic and the Cenozoic, with all of these eras in it. And some of these eras are actually marked, their endings are marked by mass extinctions, and the way that the geologists could tell, around the world, looking at different rocks that they were dealing with the same rocks, is that there are characteristic fossils found in them that disappeared all over the world at a certain time. And so, for example, the disappearance–the trilobites appear in the Cambrian and they disappear at the end of the Permian. Any rock in the world that you see that has a trilobite in it is going to be in the Paleozoic. The ammonites, you’ll see in a few minutes, appear and disappear a number of times, but they finally disappear at the end of the Cretaceous. Any rock in it that’s got a complex ammonite in it is Mesozoic. So these geological eras are actually, in part, defined by fossils, and the coordination of them across the planet is done by matching types of fossils. In the late twentieth century we had radiometric dating that helped a great deal with this, and that’s gotten better and better. But the original layout was done with fossils. And if we then take everything that’s happened since the end-Cretaceous mass extinction, that’s called the Cenozoic. So this, the Mesozoic is more or less the Age of Reptiles; the Cenozoic is the Age of Mammals; and we blow the Cenozoic up, this is what we get. We get Paleocene, Eocene, Oligocene, Miocene, Pliocene, Pleistocene. And the last 10,000 years is the Holocene; that’s since the glaciers melted, that’s the period we call the Holocene. And roughly speaking the world restocks itself with biodiversity in the Paleocene and Eocene. We have roughly modern levels of biodiversity since the Oligocene, in terms of mammal families and things like that. And most of the mammal orders have their roots in the Eocene and Paleocene; as you’ll see in a bit. Now if we look at large-scale events, one of the most interesting is well when did multi-cellular life really get going? And for that the tiny fossils that are preserved in phosphate beds in China are absolutely astonishing. These things have been discovered within the last ten years. They come from a number of places in China, but this spot, Chengjiang, in Yunnan Province, is–I think it’s on Yunnan; it might be just on the border with another province there; no province lines in the map–are certainly some of the earliest and most intriguing. So the Cambrian starts at about 550. So this is 20 million years before the Cambrian; we’re in the Vendian, we’re in the late-Proterozic Era. And a lake, or an inlet, dried up and the salts in it crystallized and they perfectly preserved the algae that were in it. So these are micrographs of microfossils showing multi-cellular algae, and in some of them you can even see the spindles in the mitotic divisions. In formations in China of the same age, there are multi-cellular, bilateral animals. These look like early-stage cell divisions of Crustacea. So this is again 20 million years before the Cambrian, and the implication that there might be a Crustacean 20 million years before the Cambrian is a very interesting one, as you’ll see in a minute. So our molecular phylogenies suggest, looking not at the fossils but at the molecules, that the eukaryotic radiation–so that’s before multi-cellularity; this is just the eukaryotic cells making Protista–that was underway about a billion years ago. These microfossils support the idea that many groups may have diverged before the Cambrian, but we have no trace of them in the fossils. We just have this marker; we have these Crustacean-like embryos. Now if that’s really true, then the first fossils of large animals, animals that you could see with the naked eye, that had hard body parts, that had endoskeletons or exoskeletons, these things crop up in the Cambrian, and they may simply then be recording the fact that formerly soft-bodied things started to acquire skeletons. So the groups existed before then, they just couldn’t be fossilized, and that that may very well have been because of co-evolution with predators. So that’s the picture that seems to be emerging. I just want to remind you that the Tree of Life has these three big groups in it, and we’re now going to blow up this part of it. Here we are. The Chinese microfossils look like they’re right about here, and they are at 570 million years ago. And if we just walk out around the Tree of Life, and say, “Oh, anything that has that branch length from what we think is the origin, was probably there at the same time, even though we don’t have a fossil of it.” That’s the implication of the molecular phylogeny; it’s that everything else that’s about that far out from the common ancestor was probably there at the time. That means that all these other branches were there too. Now most of these other things are single-celled organisms, and we wouldn’t expect them to leave fossils. Okay? I mean, we’ve got stuff like slime molds and amoebas and euglenas, the ancestors of–let’s see, where is malaria and stuff like that? We’ve got all kinds of algae out here. Those things were probably all there. We just don’t have fossils of them. And that’s why it’s really important to be able to deal with both the molecular phylogenies and the fossils, because they complement each other and they allow a kind of inference that’s not available from either alone. Now, what happens in the Cambrian? That’s when we really start- when the fossil record really gets going. The idea that there was an explosion of biodiversity in the Cambrian seems to be well supported by the fossils. Okay? This is the number of orders that can be observed, of animal groups. So these are fairly large clades of marine invertebrates that start–and some, by the way, by the end of the Cambrian, we start picking up vertebrates as well–and they start getting added on at a pretty high rate. And the interesting thing is no major body plans appear in the fossil record, in animals, after that. They do in the plants, but in the animals it’s as though there’s one burst of diversity, 550 million years ago, and then all the major body plans get frozen, and we don’t get new kinds of animals after that. That’s kind of a puzzling and not completely solved problem. Why was it that way? Now let’s take a look at one of these communities. They contain some organisms that are profoundly weird. By the way, they weren’t very big. The giant among them, the sperm whale of the Cambrian seas was this guy, up here. Okay? That’s Anomalocaris, and that is an arthropod predator, arthropod-like predator, and it’s got some funny sort of quasi-tentacle antennae, and a mouth right here, and it swims around, and it’s the biggest, nastiest thing in the ocean, and it’s about this big. So if you are skin-diving in a Cambrian sea, you don’t need to worry about white sharks. You are actually the biggest, meanest thing around. Okay? And that’s an interesting observation. Again and again, in fossil history, things start small and get big. Things start small and have short generation times and short lives, and get to be big and have long generation times and long lives. And I don’t mean by that that the small things are replaced by the big things; the big things add onto them. It’s like a community would be dominated initially by small things, and they would continue to be there, but big things would evolve. So this is that process starting to happen. There are a few things that were running around, in these oceans, that we don’t have anymore. There are trilobites here, of course. There is this profoundly puzzling creature. Okay? And we’re going to–that’s Opabinia–we’re going to take a good look at it, in a few minutes. That’s one of the favorite animals of Derek Briggs, who’s now the director of the Peabody Museum. Derek, by the way, has great BBC cartoons of the way these things swam and moved. He’s done the functional morphology of the Cambrian community. So if you’re interested in that, maybe you could talk Derek into having a showing. So that is something that’s not around anymore. But something like this is. That’s a priapulid worm, and there are still priapulid worms that look pretty much like that. So that thing is now a living fossil. And here’s an Onychophoran, and Onychophorans that look just like that are running around the Australian rainforests now; instead of living on reefs, they’re running around the rainforest, but they look pretty much like that. Okay? So the things that we get in the Cambrian are at least three of the mollusk classes. So these are the chitons, these are the snails, and these are the squids, octopuses and ammonites. We get the polychaetes, which are the biggest group of the annelids–the ones that are most familiar to you are probably earthworms; those are oligochaetes. But the polychaetes–I think there are 43 families of polychaetes. They’re a very dominant group in the ocean, and have been for 550 million years. We start getting arthropods; so we get the trilobites. The chelicerates are the horseshoe crabs and the spiders and their relatives, and we start picking up some Crustacea. We get the brachiopods, the lampshells, which are still around. If you go diving on a reef in Malaysia, you can see brachiopods. There are deep-water brachiopods around the world, but they’ve mostly been in retreat for a long time. And we get echinoderms, and the fact that we get echinoderms is interesting because they’re the sister group of the chordates, and that implies that the chordates had diverged from the echinoderms, at that point, and they just weren’t fossilizing. And we know, from the first fossils that we can get of things like Amphioxus, that if you have a tiny, little, one-inch long, translucent, tadpole-like, fish-like chordate, that’s the ancestor of the vertebrates, it’s probably not going to fossilize. So our best evidence that that divergence had occurred is the existence of the echinoderms. And by the way, the echinoderms went through an explosive radiation. They made many classes. The different classes of the echinoderms now are things like the asteroids, which are the starfish; the holothuroids, which are the sea cucumbers, and so forth. There are, I think, six or seven classes currently of echinoderms; but back in the Cambrian there were about twenty-five or thirty. Most of them have now gone extinct. And some of those things that you saw in that earlier picture were extinct classes of echinoderms. Okay, so for the animals there’s this explosion 550 to 500 million years ago in the Cambrian. It’s very different for the plants. The plants had a much steadier, more measured evolution of diversity. Okay? The major groups of plants arrive later because plants got onto land later. Most of the animal groups, all the animal groups originated in the ocean, but much of plant diversity originated on land; so they had to get onto land. The mosses and the ferns appear in the fossil record in the Devonian, about 400 million years ago. The gymnosperms, which is pines and firs and their relatives, they actually are 350-million-years-old. So they appear in the early Carboniferous, and they undergo continuing evolution up to the present day. So they keep getting- diversifying and becoming more sophisticated. But there are recognizable gymnosperms 350 million years ago. And when the flowering plants evolve depends on whether you’re looking at molecules or fossils. The molecules suggest that it might be as old as Carboniferous-Permian-Triassic; that is, 200 to 300 million years ago. Some people don’t believe that. The really solid evidence, of course, is the fossil, at a certain age, and that’s in the late-Cretaceous. So you can see angiosperms that are 75-million-years-old in the fossil record. This is what the first plant on land might have looked like, and the first plant on land might actually have been a liverwort. So this is a thalloid liverwort. And when you look at it, it looks a fair amount like algae that we are familiar with and that we see in the intertidal zone. It doesn’t really look that different in its structure from a marine alga, but it is adapted for living on land. And to get onto land this is what you need. If you’re an animal, you’re going to have to come up with an impermeable skin. If you want to locomote on land, you’ll need limbs, and for that you’ll need shoulder and hip supports. And if you want to reproduce on land, rather than in the water–which is, of course, what many of the amphibians have continued to do–then you’ll need an egg that won’t dry out. So you need a shell and an amnion, and this basically is something that happened between the amphibians, and then everything that came later in the tetrapods. If you’re a plant, you need an impermeable leaf. That means you need to invent the biochemistry and the developmental biology to make a waxy cuticle. You need a means of gas exchange. So you’re going to have to invent all of the neat stuff about stomata and stomatal regulation of carbon dioxide coming in and oxygen going out. And you’ll need to have roots, resistant spores; eventually you’ll need seeds. So there’s really quite a bit of stuff to evolve, when you come onto land. This is a major event. It was complicated and it took some time. If we look at the vertebrates coming onto land, here are some late-Devonian lobe-fin fish. So the group that seems to have spawned the tetrapods is related to the Coelacanths, the lobe-fin fishes. I’ll show you a picture of Eustenopteron and Ichthyostega in a moment. And these things start–this creature, Eustenopteron, is actually a pelagic fish. It’s not really crawling around in the drying up lagoon; it appears to be swimming in open water. But, as you’ll see in a minute, it has really pretty good beginnings of the tetrapod limb. So it looks like some of the structural elements in the skeleton, that were needed for things to come on land, probably developed for other reasons, in another environment, as an exaptation, something that happened for other reasons earlier in evolution, and that could then be co-opted and used to get onto land. And these are some of the relatives. Okay? So you can see Coelacanths in the fossil record at 360 million years, and you can see them from a submersible off Madagascar today. They’re a nice living fossil. Here’s Eustenopteron. The skeletons are recovered from Miguasha in Quebec; 385-million-years-old. It was a pelagic fish, and you can see that it already is getting, in its hind limbs, many of the identifiable elements of a vertebrate limb. So this is a blowup of the pectoral of Eustenopteron. It appears to have a humerus. This is Ichthyostega. This thing is a transition form between fish and amphibia. It’s late-Devonian; it’s 20 million years later. These usually come from eastern Greenland; that’s where the fossil deposits are. And this guy already has most of the elements of the vertebrate limb. So this developed in a swimming environment. This guy arguably was crawling around in shallow water, but he can’t support himself as an adult. That shoulder girdle and the hip girdle are not strong enough for that animal to actually walk on land, if it’s an adult. The larvae could. So perhaps the first stage of coming onto land was the kids went exploring, and then they went back in the water and grew up to be adults. The parents couldn’t go into the new habitat because they didn’t have limbs that were strong enough to support them. I think that’s kind of a cool idea. So it might have been that, just like with computers, the young were showing the old which way was up. If we look at the plant radiation, there’s a whole series of acquisitions of major elements of what it means to be a plant, and they occur at a pretty steady pace between about 450 and 75 million years ago. So chlorophyll B is quite old. I would guess that chlorophyll B is on the order of maybe 1 to 1.5 billion years old. You get plant cell structure probably at the level of about a billion years. You get alternation of generations, haploid/diploid generations, coming in pretty early. Then you have, as you move out of the mosses, and move towards the club mosses, you can see that the water delivery system, of plants, starts to develop. So they’re developing roots and they’re developing all of the plumbing that will allow water to move and bring nutrients from the roots up into a growing structure. Wood starts to develop right about in here, and by the time you get up into the Equisitifolia and the precursors to the gymnosperms, you’re getting pretty well developed xylem; so you’re getting phloem, complex xylem, and a pretty good delivery system. Then the seeds evolved with the gymnosperms; gymnosperm means naked seed. And this is the radiation here of the gymnosperms. The Pinales would be the pine trees, and firs, and all of that. And the Gingkoes, of course, are the familiar Gingko trees; there’s one down here at the corner of the Peabody Museum. And that makes a clade. And that’s where seeds were invented. Then as we go up further, we get into pollen grains that have a distal aperture, and then finally we get to the flowering plants. And at the base of the angiosperms, down here, there are some wonderful and weird plants, and the only one that I’d really like to mention now, time permitting, is Welwitschia, which is the Gnetales. And Welwitschia is a plant that basically is a root with two leaves, and the two leaves can grow to be up to 100 or 200 feet long. It lives in the sand dunes of Namibia, and because sand drifts and makes dunes that grow, Welwitschia can keep growing to keep its leaves on top of the dunes. And so some Welwitschias are actually 100 or 200 feet high; it’s just that they’re all below ground and they just have these big leaves that come out the top. So there are wonderful things that are represented in the plant radiation. Okay, so the theme of that basically–let me just go back and reinforce these two points. Some of the stuff that you need to get on land was developed earlier in the water, for other reasons, and then was co-opted to get you on land, and that’s what probably happened with the vertebrate limb. The plants developed much of their diversity after they had gotten onto land. And you can see that they are adding things like vascular canals and water delivery systems and things like that–wood–at a fairly steady pace, as you go up through a period between about 450 and 75 million years ago. If we then look at large patterns in the history of life, to see what kinds of messages the fossils give us, this is one of the classical ones. This is how many different families of ammonites there were. Okay? And you can think of each of these radiations, that are presented as kind of a leaf with grey coloring around it, as being roughly at the level of an order. So an order of mammals would be–to make it familiar to you–would be something like the ungulates. An order of birds would be something like the albatrosses and their relatives. Fairly big groups with a lot of species in them. And within each of these groups you can see that there are lots of families. Now look what happens to them. At the end of the–they start to radiate, back in the Devonian–at the end of the Devonian there’s a mass extinction, lots of them get cut off, two lineages come through. This lineage radiates, makes a whole lot of different species and families of ammonites. At the end of the Permian, they all go extinct. This line here manages to get two of them through–two lineages, maybe three–through the Permian mass extinction. One of them goes out in the Triassic; the other radiates. At the end of the Triassic there’s a mass extinction. Almost all the ammonites disappear again. One or two lineages get through, into the Jurassic, and at the end of the Cretaceous these two surviving branches both go extinct. So people looked at that, and what they saw was this continuing extinction, and then re-radiation, and extinction, and re-radiation, and they asked themselves, “Can the world hold only so many kinds of ammonites? Does it kind of fill up, and then when it’s wiped clean, does that create a space for the others to re-radiate?” Well the pattern is consistent with that interpretation. Consistency is a very weak logical criterion; but it’s evocative. So I leave it at that. Now that consistency comment’s going to apply to this as well. So this is the mammal radiation. Okay? And when you look at it, the first thing you notice is oh, mammals started to radiate back in the Triassic. If we were back in the Triassic we might not have called them mammals yet, but they have already split off from other ancestors, and it looks like things like the Monotremes have their roots at about that level in time. So we’re looking back about 200 million years. During the whole time that dinosaurs were the dominant large creatures on the planet, and the most diverse tetrapods, the mammals continued to radiate. There were multituberculates, there were triconodonts; there were all sorts of things, back there. They tended to be rather small, but they were perking along. Then there’s the end-Cretaceous extinction. Everything bigger than five kilos that lives on land gets wiped out, and the mammals then radiate. It would be nice if we could replicate this experiment a hundred times and see that every time the dinosaurs went extinct, the mammals radiated. Okay? We have a sample size of one. So it’s a very interesting pattern. It might very well be true. It sounds plausible, and you can’t demonstrate it experimentally. So what are the groups that are still radiating? If we just look around the planet right now, what do we see? Well the beetles are still going like gangbusters. We don’t actually know how many beetles there are. The number of beetles that have been named is I think about 350,000. The number of beetle species that might exist could be on the order of 5,000,000. When J.B.S. Haldane, who was an atheist Communist, was having dinner with the wife of the Archbishop of Canterbury, she asked him, “Mr. Haldane, what do you conclude about the nature of the creator from your study of biology?” And he turned to her and said, “Madame, an inordinate fondness of beetles.” [Laughter] So there are a lot of beetles, and they’re still radiating. The Diptera, the flies and the mosquitoes, are a young group, and they are still producing new species. Among the mammals, it’s the bats that are probably the most impressive producers of biodiversity, along with the rodents. And the place where the bats and the rodents are doing the most of this is in South America. So if you really are a mammalogist, and you want to study recent evolution and see things that are still in the process of speciating, South America is certainly one good place, and the groups to look at are bats and rodents. In the flowering plants, there is really impressive biodiversity in the composites, the orchids and the grasses. There are about 12,000 species of orchids I think. And I have forgotten–Jeremy, do you know the figures for the grasses? Teaching Assistant: Yes. I think there’s somewhere around 15,000. Professor Stephen Stearns: 15,000 species of grasses and composites. Teaching Assistant: There’s around 30,000. Professor Stephen Stearns: There are about 30,000, and they probably don’t even call them composites anymore. Professor Stephen Stearns: What are they called? Professor Stephen Stearns: They’re called Asteraceae. Okay, see, the phylogeneticists are busy, they’re on their game, they’re naming stuff. Now that’s—those are the clades that are currently filling the world with life. What about the stuff that’s been wiped out? Well all of those exotic things in the Burgess Shale, they’re gone forever, and they’ve been gone for hundreds of millions of years. The trilobites, the ammonites, the dinosaurs, those are all gone. There was a wonderful group called the glossopterids. They were Jurassic tongue-ferns; they were ferns that looked tongue-like. There’s a great story about how when South America got connected to North America, at the Isthmus of Panama, about 10 million years ago, a bunch of tough, North American hoodlums migrated south, over the Isthmus, and ate up everything in South America. They were called things like pumas and wolves and stuff like that, and they ate up the South American notoungulates. There were a few things that came north; possums, armadillos came north, but most of it was a movement south. And so there was a complex Miocene and Pliocene fossil fauna in South America that’s vanished forever. In the last 10,000 years, mostly on islands in the Pacific, 25 to 35% of the world’s birds have gone extinct. And outside of Africa, most of the Pleistocene megafauna is gone. If you want to see what the Pleistocene looked like, go to a national park in Africa, because that’s what North America looked like 10,000 years ago, when we had 300, 400-pound beavers; and there was a North American lion that was bigger than an African lion; and of course the mammoths and the wooly rhinos and all of those things. So we are actually missing a lot of this stuff. And, on the one hand, none of us probably ever woke up in the middle of the night, in a cold sweat, worrying about the fact that the dinosaurs were extinct and we couldn’t see them anymore. And some ornithologists, who know about the recent history of extinction in the world’s birds, probably do occasionally wake up in a cold sweat at two o’clock in the morning and worry that they were gone. But most of this stuff, we regard that as oh, it’s in the drawers of the Peabody Museum; it’s old, dusty fossils. But basically what we’re talking about here is vanished worlds; vanished complete communities, vanished profligate, extravagant radiations that produced life, that filled up the planet, and then disappeared. And 99% of it’s gone; we see a very small fraction that remains. And that’s actually just a fact of life. Okay? It doesn’t actually necessarily call for an emotional response, other than the observation that hey, that’s what happens. Now let’s go back to one of those places. This is a vanished community, this is the Burgess Shale, and about 500 million years ago–the Burgess Shale is about 505 million years old, so it’s sort of late-Cambrian. At that point–this is the North American craton here; so looking at its western edge, it’s eastern edge would be Quebec, and then this would be northern Canada, up here. This is the western edge. At that point it’s slightly south of the equator. It’s not connected to South America or to Asia, at that point. This is where it is today. You’re up at about 10,000 feet; you’re about two kilometers above sea level; maybe 8000 feet. This is a geologist, and this is a fossil from the Burgess Shale. That one happens to look like a trilobite. Okay? And this is the shale here. So at this site, 505 million years ago, on the western edge of the continent, there was a shallow water community that was living on the edge of a cliff, and occasionally the cliff would fall down, the sediment on the cliff would fall down, and it would bury things; and that’s what the shale consists of. You’re looking basically at a landslide that buried a lot of stuff. And these are the kinds of things that it buried. So here is our priapulid. Here is Opabinia. Here is Anomolocaris; it looks like a huge looming predator in that shot; but remember, the biggest thing in the ocean was that big, and that’s this guy right here. Here’s one cruising in the background. And these are some of the creatures that you can pull out of that shale. This is one of the most abundant. This is Marella. This is a primitive arthropod. Now remember the HOX genes, remember how to turn an onychophoran into a fly? Well this is an intermediate step. Basically you take a worm and you start specifying that the forward segments are going to form a head. So you get cephalization. You can see that it’s putting out gills and legs on most of its segments–but it’s kind of stopping to do that on its back segments–and it’s developed a hard exoskeleton. So this is steps on the way to becoming an arthropod. And we actually don’t know whether this thing is the ancestor of Crustaceans or of the chelicerates or the trilobites. It’s just an intermediate form between a worm and an arthropod. This thing is just totally bizarre. This is Opabinia. Okay? And when it was first reconstructed, it resulted in hilarity; nobody could believe it. And the thing that really gets people about it is that it has five eyes, and it’s got this proboscis that’s got kind of a grasping organ out on the end of it. So it looks sort of like a cross between a spider and a vacuum cleaner. It’s probably about this big. Okay? It’s about one or two inches long. And people just couldn’t figure out where Opabinia fits. So Derek Briggs has made the study of Opabinia one of his projects; he knows a lot about it. And it appears to be related to Crustacea. But again you can see that it looks like it’s intermediate between a worm and something else. So it’s probably some kind of intermediate form, prior to the arthropods. Now before I go on to stasis and Cope’s rule, I just want to comment a little bit on what it means that entire communities have completely vanished. It really places a very relative view on the current world. When the Atlantic was opening–and the Connecticut River Valley might have been the Atlantic, or it could’ve been a river valley on a continent; it was a rift valley at that time–there were a series of rift valley lakes that stretched across eastern North America. They run basically from Pennsylvania up to about Vermont. And they opened and closed, and opened and closed several times. Every time one of those lakes opened, the fish in them went through a big adaptive radiation, like the ammonites did, and then the lake closed and all the fish died off, and then it opened up again and another radiation of fish went on in it, and it closed up; and this happened again and again and again, both spatially and temporally, across the eastern United States, about 200 million years ago. We’re currently in the middle of a big anthropogenic extinction crisis, but it appears like this isn’t something that the planet hasn’t experienced before. Geological processes have caused many extinctions of entire communities, wiped them completely off the face of the earth, and life has re-generated new ones again and again and again and again. So that was one of the messages I’m hoping that you’re getting from the fossil record. Now what about stasis? What about the fact that the Coelacanth that you catch off the Comoro Islands today, looks almost exactly like the Coelacanth that’s in the fossil record from 360 million years ago? What about the fact that the Onychophorans that you collect in Australia today are practically indistinguishable from the ones that you see in the Burgess Shale 505 million years ago? Why is there stasis? And I mention this because if you were to write down a list of the big intellectual problems that are posed by fossils, this is certainly going to be on everybody’s list. There are others, but this is going to be a prominent one. And this is something that was called to the attention of the world’s scientific community, primarily by Steve Gould. This is one of the take-home messages of his life. So stasis basically describes a long period with no morphological change. There’s no apparent response to selection. Evolution doesn’t appear to be going on. And it is puzzling, because we know that every nucleotide sequence undergoes mutations. There is no way that you can stop the production of genetic diversity in these organisms. Okay? So for 350 million years Coelacanths don’t change, but probably every nucleotide in their genome has mutated, over that period of time. So there’s been opportunity for change, but they have not changed. The examples of this include club mosses and liverworts, lungfish, Coelacanths, the priapulids and phoronids. You saw the priapulids–I pointed them out in the Cambrian- in the Burgess Shale shot–tuataras currently still existing on an island off New Zealand, and onychophorans; there are others. So here are a couple of onychophorans. They’re kind of intermediate between annelids and arthropods; velvet worms. And here are two possible explanations for stasis. There may very well be others, but I want you to have at least these two general ones in your toolkit. And one is basically a selectionist explanation for stasis. It says that most of the things that we’re talking about have some method where either a larva or a seed can find the environment in which the adult will do well. And so there is a selection of an environment, early in life, and that actually then selects the selection pressures that will operate on the adults. We see the adults, we don’t see the larvae. Basically the larvae have been wandering around the planet, searching out the environment in which the adults will grow up, for hundreds of millions of years; and we know that marine larvae are extremely good at this. The Coelacanths, we know that they’re deep-sea creatures; they live down at about 600 to 1000 feet. That’s a fairly stable environment. The club mosses, that’s a little harder to see how this would work. But at any rate, this is one option. Okay? So this is one of our alternative hypotheses. The reason things stay the same is that young life history stages find the environment in which adult selection will take place, and adult selection is stabilizing. Intermediate values are selected for. Things don’t change. On the other hand, there’s a contrasting hypothesis, which is an internalist explanation. Basically it is that tradeoffs are creating the stabilizing selection–that’s one possibility–so that instead of having an ecological explanation for why there’s a long period of stabilizing selection, we have an internal physiological or developmental explanation of why selection has been stabilizing. But there’s another part, another option in the internalist explanation, and that is that early on, both in evolution and early on in development, key traits get fixed; key things get set up. The development of the eye depends upon the relationship of two tissue layers, so that there will always ever thereafter be nerves and blood vessels in front of the retina. Okay? So if those things are laid down early, both in evolution and then in development, occur early in development, there’s kind of an embedding. That means things have been in place that can’t be changed without destroying normal development. Now there are arguments for and against all of these things. You can find early developmental traits that have undergone a lot of evolution without destroying the adult form. So there are some real issues with trying to understand the mechanics of how this would work; and we don’t know yet. Okay? I’m just giving you a few ideas that bear on the issue. The other major take-home message is–that I’ve already signaled as Cope’s Law. And again, there are two options here. One is that the reason that we see bigger things is that there’s just a neutral evolution. Adaptive radiations have been creating little things and big things. But there was more room on the upper end than there was on the lower end; therefore even though it’s been random, we see an accumulation of larger things, just because the upper limits are far away. Okay? The lower limit on body size is always nearby; it’s one cell, you don’t get smaller than one cell. But the upper limit appears to be redwood trees and blue whales, and at least at the outset that’s pretty far away. That’s up at about 100 meters, for redwood trees, and about 30 meters for blue whales. So that’s one possibility. The other is that the reason that things got bigger is co-evolutionary. Co-evolution is shaping prey to escape and predators to kill, and prey can escape predators by getting too big to eat, and predators can kill big prey by getting bigger than they are. So this would be an adaptive life history hypothesis, saying that Cope’s law results from a co-evolutionary arms race between predator and prey. And we don’t really yet have a powerful method for disentangling these two effects. And I think if you look at their logic, you can see that they’re not mutually exclusive; they can both be going on at the same time. Okay, so what does the fossil record tell us? It shows us a lot of stuff that we couldn’t see at shorter time scales. We see a lot more detail in the recent than in the distant past. It looks like mass extinctions may open up ecological space, for the radiation of surviving groups. So it may be that you need an extinction before you can have a big radiation. Most things start small and get big. And there’s a lot of stuff that’s not on the planet at all anymore; there are no surviving descendants. So the fossil record has a take-home point, that’s actually a puzzle that can be attacked experimentally, in part by people doing evolutionary developmental biology and phylogenetics, and that is, why is there stasis? It’s common, and we don’t have an explanation for it.